A good way to see most of the island in just one day and take advantage of the knowledge of an experienced local guide is to join an island tour. Below there is list with the most popular Santorini island guided tours. 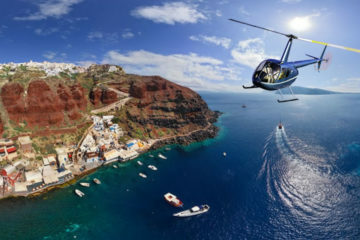 An island tour will take you to the main historic, cultural and picturesque sites of Santorini, like Akrotiri, Oia and Pyrgos, leaving you also enough time to explore each one of them at your own pace. No need to hurry up, after all you are on vacation! 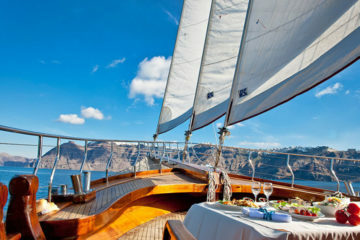 Depending on your interests you can find many different tours that combine various Santorini’s highlights. You can find the most popular Santorini tours here. A unique experience is hiking from Fira to Oia, a picturesque route of approximately 4 hours duration. If you are not fit enough, you can ask your guide to make only part of it, picking the most scenic parts. You can read all the details about available hiking or other outdoor activities tours like photo tours or off-road tours here. For those wishing a more flexible itinerary that better fits their needs and wishes, there are many private island tours available to choose from. You can explore the most known or hidden places, according to your preferences. E.g. you can combine swimming and sunbathing to the best beaches with visits to archaeological sites and to picturesque villages. There is the option for a half or full day tours. If you want to explore as many beaches as possible in one day you can join a beach exploration tour which takes you by boat to the most known beaches of Santorini like White beach and Red beach as well as the Hot Springs and the small caldera island of Aspronisi. Very close to Santorini you can find Thirassia island, a small picturesque, volcanic island opposite to Oia . During a walking tour on Thirassia island you will have the chance to meet the locals, walk through traditional paths, discover hidden houses built into natural caves and enjoy a traditional Greek lunch or dinner while enjoying great views to Santorini.